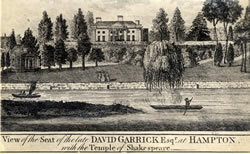 David Garrick moved to Hampton House, now known as Garrick's Villa, in 1754. He had been born into a Huguenot family, in Hereford though most of his early life was spent in Lichfield. He attended the local grammar school and then a short-lived school run by his friend Samuel Johnson, the great man of letters, who was the son of a Lichfield bookseller. He intended to study law and set out with Johnson in 1737 to seek a career. He was coached at Rochester for a time and on his father's death came to London and founded a wine merchant's business with his brother, off the Strand. He had been involved in family theatricals as a child and through wine selling to coffee houses, in Covent Garden, became acquainted with theatre managers and actors. Starting by writing plays he progressed to acting. His performance as Richard III, in 1741, took London by storm. 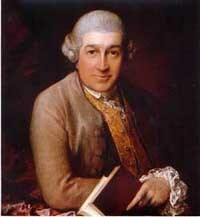 By 1747 he had earned enough to buy a half-share in managing Drury Lane Theatre. His long relationship with Peg Woffington came to and end in 1744 and he married an Austrian dancer, Eva Maria Veigel, in 1749. They enjoyed a happy marriage, although unable to have children. To escape the pressure of London theatrical life he came to Hampton in 1754, first renting and then buying the copyhold of the property known as Hampton House. Garrick employed the Adam brothers to improve the house, in two distinct phases (1755-56 and 1772-74). The house was an amalgamation of some old cottages, unified by the addition of its distinctive portico as well as what looks like yellow facing brick (in fact mathematical tiles that imitate brick). Capability Brown was consulted over the grounds and suggested building the, still existing, grotto-like tunnel under the road joining the house to the riverside part of the grounds. He also suggested the building of serpentine paths, as recently reconstructed in the Temple Lawn gardens. In 1755-6 the octagonal Temple was constructed, possibly modelled on Lord Burlington's temple at Chiswick House, to entertain visitors and also to house some of the mementos to his beloved Shakespeare. He also commissioned Roubiliac to make a portrait bust of Shakespeare for a large niche in the Temple, a replica of which has been installed in the Temple, which is now open to the public. 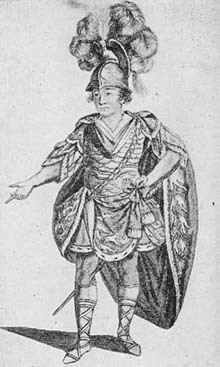 Naturally, as a Hampton resident Garrick was noticed by Walpole who rather disparaged his social standing as a wine merchant turned actor. He enjoyed professional and friendly relations for many years with the actress Kitty Clive, Walpole's neighbour and friend at Little Strawberry Hill. 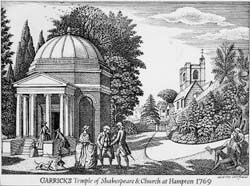 Garrick promoted the Shakespeare Jubilee in 1769, which lost money but probably marked the beginning of the Shakespeare industry. It also left Garrick very firmly linked with Shakespeare. "I do think the pomp of Garrick's funeral perfectly ridiculous. It is confounding the immense space between pleasing talents and national services."